Let us take you upstairs. There you can find our guest rooms. 1 appartment (up to 6 persons). 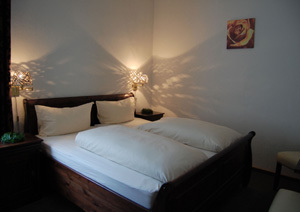 Our guests feel confortable in the rooms which are stylishly furnished with natural wood. All rooms are equipped with shower, lavatory, radio, cable TV and some provide a balcony as well. There are big teraces both in front of and behind the house.